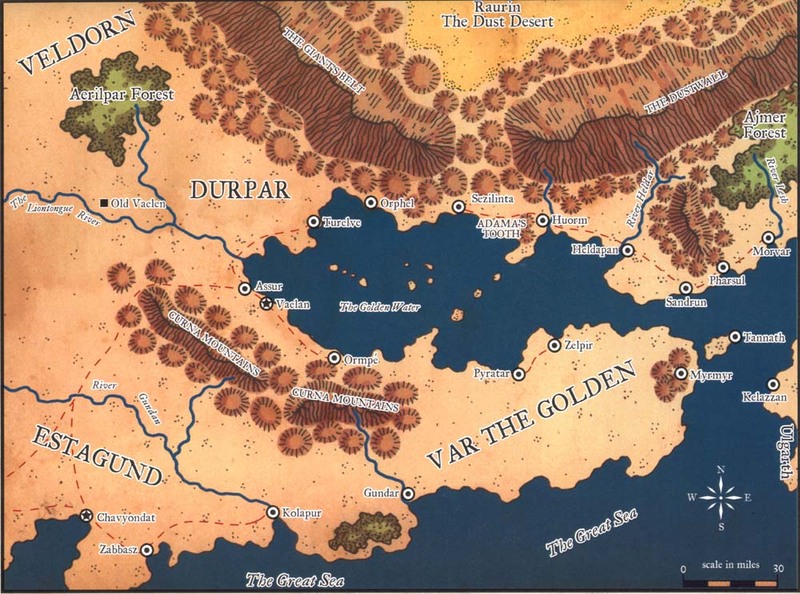 Durpar, Estagund, and Var the Golden, the three trading nations collectively known as the Shining Lands, sprawl around the large bay known as the Golden Water, just off the Great Sea. These balmy countries soak up the warmth of the southern sun at what most folk consider to be the extreme southeastern end of Faerûn. Many assume that the Shining Lands mark the end of the civilized world, since all that lies beyond the bay is the Utter East - a collection of lands known to most of Faerûn only through legends too fantastic to be believed. Some claim that the Shining Lands have taken on many of the strange characteristics of their more bizarre eastern neighbors and as such are hardly recognizable as part of Faerûn at all. Though Durpar, Estagund, and Var the Golden differ in their forms of government and internal operations, all three champion trade as a way of life. Merchant consortiums known as chakas provide products and services, and their leaders, known as nawabs, hold both political and economic power. All three nations also embrace the Adama, a combination of a religious belief and a code of conduct that guides citizens in their daily lives. The Shining Lands stretch for nearly 500 miles, from the very end of the Toadsquat Mountains and the Lluirwood eastward to the nation of Ulgarth. From the Great Sea, which marks the southern boundaries of Estagund and Var the Golden, the territory rises gently until it reaches the southern slopes of the Dustwall, covering a distance of nearly 250 miles. Estagund occupies the western part of the plains, while Var the Golden extends out onto the peninsula on the south side of the Golden Water. Durpar hugs the bay along its southwestern, western, and northern sides, occupying a narrow, horseshoe-shaped strip of land between the water and two mountain ranges. Though technically not considered part of the Shining Lands, Veldorn (which is known as the Land of Monsters) sits closer to those three countries than perhaps any other region. It occupies, the grassy stretch of land just north of Estagund, wedged between the eastern limit of the Shaar and the Giant's Belt Mountains. Flat, sun-baked plains suitable for growing crops such as wheat, coffee, and warm-weather vegetables dominate the Shining Lands. Where the land hasn't been tamed, the countryside consists of endless miles of gently undulating ground covered with coarse grass, cactus, and the occasional copse of squat, thorny trees. Dry gullies break up the terrain from time to time, but otherwise, the only limit to line of sight in this part of the world is the next distant rise. Civilization in the Shining Lands clusters around the available water. Towns and cities hug the coast of the bay and the banks of any rivers large enough to continue flowing in the hottest, driest part of the summer. The areas farther inland are much more thinly populated, despite the generally pleasant conditions. Few humanoids live in any of the mountain ranges in and around the Shining Lands, since the monsters that claim the slopes fight fiercely for the limited food supplies there. The weather in the Shining Lands is hot almost all year. The area gets plenty of sunshine and most of the country (with the exception of the Great Sea's coastline) experiences a mild rainy season. On most days, steady breezes blowing off the ocean cool the land along the coast, making the temperature bearable once the sun slips low in the west. Inland, the breezes gently billow through the waving wheat, making the land seem like a great, dun-colored ocean. During droughts, the winds in the plain occasionally stir up great dust clouds that hamper travel. Because most of the region consists of flat, grain-covered plains, the unusual physical features of the Shining Lands stand out all the more prominently. Some of these features serve as barriers along the borders, while others simply rise up from the midst of the land like beacons. Known also as the Wood of Dark Trees, this small but dense tropical forest is a gloomy, dangerous blight on an already monster-infested region in the far eastern section of Veldorn. The wood fits well with the rest of the Land of Monsters, since few who enter its steamy depths ever return. Despite the Aerilpar's reputation, more than a few brave explorers have attempted to navigate it, seeking the many treasures hinted at by rumors that circulate in other lands. The two biggest threats within the Aerilpar Forest are the flying snakes and the dark trees. Both of these creatures abound within the woods, somehow coexisting while making the area extremely dangerous for other creatures. In addition, a mated pair of chimeras has established a comfortable nest near the middle of the forest. Each has black dragon head, and the two have trained a few of the native acid snakes to serve as guard pets near the handful of eggs the female has laid. In the very center of the forest, a 40-foot-diameter, 4-foot-high, circular stone wall sits in a clearing, with tree branches growing right up to it, but not over the top. Inside the wall, a steep, grass-covered hill rises to a central peak more than 30 feet high. A hallow spell and a permanent Mordenkainen's private sanctum spell protect the entire area inside the wall. Needless to say, the creatures of the forest stay clear of this mysterious mound. This rather small range is sometimes known as the Bluetips or the Mountains of Wisdom. These mountains stretch along the northern coast of eastern Estagund and western Var, forming a barrier between those two nations and the Golden Water to the north. As mountains go, the Bluetips are short and well worn, with far more gentle, grassy meadows and slopes than jagged outcroppings of rock. The tangled copses of suth trees that dot the slopes of the mountains occasionally make travel quite difficult. Despite their unimposing appearance, few venture into the Curna Mountains because the range has always been home to a number of fell beasts. In fact, when the Durpari barbarians first began to settle the Shining Lands, they referred to the northwestern end of the range as the Beastlands because of the surprising number of deadly creatures that swarmed down out of the lowest passes to harass them. Later, after the Durpari had developed a more sedentary lifestyle, the creatures of the mountains preyed upon their trading caravans. Modern-day sages have speculated that some unnatural feature hidden within the mountains (a portal, perhaps, or some magical monster-generating horror) must have caused this unusual concentration of monsters. The tales and stories, along with the few sketchy records that exist, seem to indicate a far greater rate of population growth than normal, given the types of creatures present and the available food. Regardless of the speculation, no one has ever discovered any anomaly hidden in the mountains that could possibly bring about such a situation, and the influx of new monsters has dropped considerably from what it was centuries ago. Currently, a number of leucrottas roam the lower slopes of the Curnas, occasionally wandering down toward human settlements to prey on shepherds and travelers who stray too far from safety. A mated pair of rocs that lives among the highest peaks feasts primarily on the leucrottas, though the two occasionally soar out over the bay to fish for sharks, dolphins, or marlins. A true menace dwells in a cave complex high in the eastern end of the range, just southeast of Ormé. Zesilias (LE medusa sorcerer 5), who has a thirst for magic, hides in the mountains with her manticore companion. The two work together to gain treasures and magic items to feed Zesilias's habit. The manticore wears an amulet of proof against petrification that allows it to remain with the medusa without risking the effects of her gaze. Zesilias and her pet prey on the citizens of the coastal communities just north of the mountains, often venturing forth in disguises (magical and otherwise) in search of more magic. Despite the dangers of the mountains, some dwarves recently formed a merchant house (the Gemstone Chaka) in Ormé after discovering a motherlode of emeralds there. Known as Curna emeralds, these stones have an unusual mineral property that causes their centers to give off a turquoise glow when cut properly. The chaka jealously guards the location of its mine, but rumors around Ormpd have hinted that the dwarves discovered an ancient map in the city's great library that led them to the emerald veins. The discovery of the Curna emeralds has made the Gemstone Chaka quite wealthy in a short period of time, and its members have gained considerable political clout. In fact, the head of the Gemstone Chaka now holds a seat on the Nawab Council of Durpar and was instrumental in the decision to relocate the capital from Heldapan to Vaelan (see Politics and Power). The mountain range known as the Dustwall has many names, including the Mountains of War, the Mountains of Adama, and the Gryphon Mountains. Among the tallest mountain ranges in Faerûn, the Dustwall forms a high, forbidding barrier that separates Durpar from the Raurin Desert. Unlike the Curnas, these mountains are raw, rough, and towering. Most peaks along the highest central ridge easily reach 15,000 feet, and Adama's Wrath, the highest point, tops 22,000 feet. These harsh, treacherous mountains form an effective barrier against the raging dust storms that pervade the Raurin on the far side of the range. Legend has it that the Dustwall rose during the cataclysm that destroyed the ancient Raurin Empire, and anyone who views the range harbors little doubt as to the authenticity of that tale. The Dustwall is rocky and steep, etched with gorges and deadfalls all across its length. The hills that abut the mountains are jagged, scree-covered ridges, the intervening valleys choked with rocky outcroppings and thorny brush. Little vegetation grows in the Dustwall range, except for the hardiest scrub growth. Despite its forbidding nature, the Dustwall swarms with gray orcs. Some say that the total number of these creatures exceeds the population of the Shining Lands as a whole, though others reject such a claim, pointing to the lack of available food to support such numbers. Still, when a gray orc horde descends upon the plains of Durpar to raid, its numbers sometimes equal the population of a small town. Folk living near the gray orcs' hunting range are ever watchful for attacks. Recent reports have indicated that a few rakshasas might be settling in among the gray orcs, planning to bring them to heel and forge an empire in the lowlands after the humans have been vanquished. In addition to the gray ores, the Dustwall range supports wyverns and various kinds of giantkin, including ogres, cyclopes, stone giants, and hill giants, as well as a few storm giants. Also, rumor has it that a frost giant clan dwells high among the peaks, where the snows last year-round. No one is certain how the frost giants could have gotten there when the climate in the lowlands around the mountains is so hot, but the rumors persist nonetheless. Like the Dustwall, the Giant's Belt range forms an impressive and desolate barrier between the lowland plains of the Shining South and Raurin. Actually a continuation of the Dustwall, the Giant's Belt range is nearly as high, and just as rocky and crag-filled. The Giant's Belt juts up suddenly and steeply from the grasslands of Veldorn, looking all the more forbidding because of the drastic change in elevation. The Giant's Belt is aptly named because the rubble-strewn slopes of its mountains support a large and well-organized clan of hill giants led by a particularly crafty and disagreeable specimen named Gruzog Granitejaw (CN male hill giant druid 5/runecaster 5). Gruzog has recently joined with the other beast-chieftains of Veldorn in a mutual assistance pact. His clan skirmishes occasionally with the stone giants that live in the far northern end of the range. This tranquil bay forms the coastline for the majority of the Shining Lands. Protected from the harsher ravages of the sea by both land and barrier reef, the waters of this sheltered inlet are unusually calm and clear. The fishing in the Golden Water is sublime, and the daily catch keeps almost every table in the coastal settlements supplied with fresh seafood. At any given moment, scores of trading ships and naval vessels are visible from any point along the surface of the bay. Some of these ships carry cargo to the various ports along the shore; others keep watch for creatures that could menace the shipping. The Golden Water contains certain minerals that give off a warm, golden hue when struck by the light of the rising or setting sun. This phenomenon is what originally gave both the bay and the Shining Lands their names, though now, most Faerûnians associate these monikers with the locals' love of trade and the gold it brings them. Most of the sea creatures that dwell in the Golden Water are peaceful, though schools of sharks sometimes disrupt the pearl-diving and coral-gathering operations. The aquatic elf city called Nemilar sits at the bottom of the bay in the middle of its expanse, just northeast of Ormé. Several years ago, a fanatical aquatic elf druid named Di'lishae Lheilos (N male aquatic elf druid 12 of Deep Sashelas), used the awaken spell to give a giant octopus sentience. He hoped to gain the creature's aid in stopping the destruction of the coral reefs by nearby humans, who regularly harvested chunks of the coral to make jewelry. The octopus, who took the name Slulushtup, gladly provided the aid requested, but it was not enough to stop the humans' depredations. Afterward, the octopus studied Di'lishae's ways and eventually embraced the druidic path himself. Now Slulushtup (N male awakened giant octopus druid 9 of Deep Sashelas) has taken up residence near the chain of islands that divides the eastern half of the bay from the western half. He has begun using his own awaken spells to create a cadre of intelligent sharks and dire sharks, which he has convinced to patrol the reefs and attack coral harvesters. Sometime before the founding of Mulhorand and Unther, an empire of wizards rose up in the eastern lands of Faerûn. Known as Imaskar, this nation was a place of mighty magic, strange technologies, and terrible hubris, even in the face of the deities themselves. When the Imaskari brought a whole horde of slaves through a portal and then sealed it to trap them in Imaskar forever, no one dreamed that the deities of those slaves would come to Toril and wreak their vengeance upon the prideful wizards. The wasteland now known as the Dust Desert of Ratwin is the result of those deities' dreadful vengeance. Terrible sandstorms ravage the blasted land where Imaskar once stood, tearing at the ground, the foothills, and the few creatures bold enough to make their homes here. Lightning and thunder rage back and forth across the featureless flatlands, but no rain ever falls. Clouds of dust swirl and buffet everything in their path, preventing even small piles of stones from remaining intact for long. A scant few creatures find the lashing wind and tearing, blowing sand to their liking. Both blue and brown dragons are fond of the Dust Desert, though their battles with one another sometimes rumble so loudly that they drown out the buffeting winds howling around them. In addition, a few genies occasionally gather here for private discussions or to battle one another. Djinn visit most often, since the interminable winds are similar to those characteristic of their home plane, but efreet also drop in from time to time to enjoy the scorching air and bone-dry conditions. Little remains of Imaskar's great cities, and the few partial structures that do exist are often buried in the shifting sands. Legends speak of vast ruins filled with wondrous and powerful artifacts, as well as long-lost secrets of magic coveted by modern-day wizards. Rumors also persist of a great underground temple to Set hidden somewhere in the center of one of those ruined cities.